Team USA's lovable (?) swimming scamp — who ditched his sassy grey locks from the Olympics for a new ~serious~ brunette — and appears to choke up as he tells Matt Lauer that, basically, he screwed over his teammates/the Olympics by freaking out at a Rio gas station and then lying to his mom/the world about it. I will say this, he's certainly more actually apologetic than he was in that "I'm kinda sorry?" letter from earlier this week. Let's dive into the interview, shall we?! In it, he drops some serious bombshells. For instance, he was "intoxicated" when he made initial TV appearance about robbery claims and "over-exaggerated" the story. "I was still under that influence, and I'm not making me being intoxicated an excuse. It was my fault, and I shouldn't have said that," he told Lauer. He also said he lied about the gun and that it was never pointed at his head. When speaking about leaving his team behind in Rio while he escaped to the United States, he said he felt "hurt" that he let his team down. "I wanted to be there, I don't want them to think that I left. And umm left them dry, cause they're my teammates and I definitely wanted to be there," he told Lauer. "And I wanted to help out anyway I could. And so I just wanted to make sure they were home safe before I came out and talked." He said he is finally taking responsibility for his lies, "because if I didn't over-exaggerate the story to what I said when I did it when it first happened with Billy Bush, and yourself and I told you the full story, none of this would have happened." 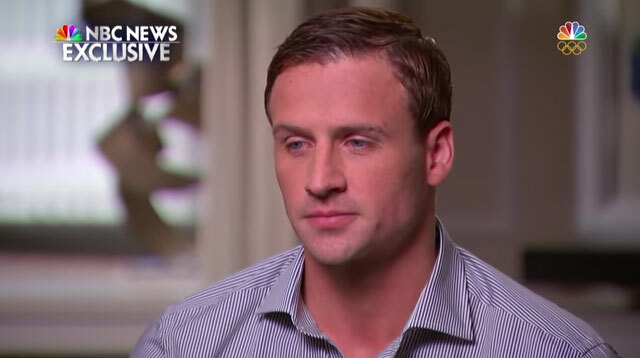 The full story, as he tells it now, is pretty much that Lochte caused some damage at the gas station, refused to pay for it, had a gun pulled on him by the station's security guard, and then finally gave them some money for the damage. He also said in the interview that he knew the guards weren't robbing him, but rather wanting payment for the damage done. "Yeah, so then we had to give the money," he told Lauer. Lochte ended the interview with, "I'm human. I'll definitely learn from this. I'm just really sorry and I hope they can accept my apology."